Normally, this calendar notes the birth dates of important conservationists and environmentalists. But today is noted because it was the date when three famous authors died—William Shakespeare, Miquel de Cervantes, and Inca Garcilaso de la Vega. Not only did they die on the same date, April 23, but they all died on the very same day, April 23, 1616. 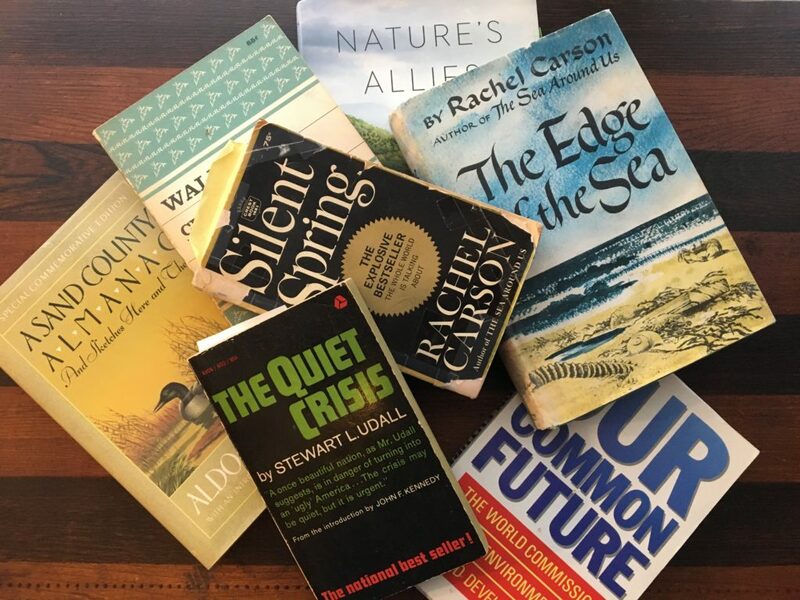 So, I thought today was a good time to remind us all of those conservation and environmental books that have had huge influences on our approach to sustainability. In the late 1990s, an internet book review service asked a variety of people—writers, reporters, professors and plain readers—what books they thought most influential. Guess what? The number one most influential book, mentioned by 83% of respondents, was Rachel Carson’s Silent Spring! Not surprised, are you? At number two was the annual State of the World books produced by the Worldwatch Institute. Third was Soft Energy Paths, by Amory Lovins. A whole shelf could be covered by Amory Lovins’ contributions to sustainable energy. Fourth was Paul Hawken’s Natural Capitalism, a book that discusses how our economic systems are dependent on nature systems. Another Hawken book, The Ecology of Commerce, came in at sixth. What about fifth place? You’ve been waiting for this—Aldo Leopold’s Sand County Almanac. When first published in 1949, this book was pretty much overlooked, but it became a popular classic—the environmental equivalent of the Bible—when published as a paperback in the 1970s. There appear to be as many lists of great environmental books as there are environmental books! Some cover all time, some just one year. But going farther back than the 20th Century, and farther forward as well, a couple of clear winners need to be mentioned. Henry David Thoreau’s Walden was probably an early inspiration for many of us who love nature. And Al Gore’s Earth in the Balance had a substantial influence on modern public policy on the environment. Each of us could provide our own list of those books that made us sit up and take notice. Does yours include Dr. Seuss’ The Lorax? Or perhaps Paul Ehrlich’s The Population Bomb, the book that scared most of us in 1969, when it appeared. My desire to be in nature as much as possible came early from Jean Craighead George’s young adult adventure story, My Side of the Mountain. And reading Rachel Carson’s The Edge of the Sea set me firmly on the path to a career as a fisheries biologist. As I look at the book shelves around me as I write this calendar entry, I see many others that are special to me. Stewart Udall’s The Quiet Crisis, about our need to protect nature areas as parks. Our Common Future, the report of Gro Harlem Brundtland’s World Commission on Environment and Development. Gifford Pinchot’s The Fight for Conservation. The poems of Robert Service. But the content of my bookshelf is not the point. The point is that I have a bookshelf, full of books that influenced me as a conservationist. And so do you. This is not something we should take for granted. Freedom of expression, through a free and open press, is essential to a civilization, especially one that needs to grow and change to make a better, more sustainable world. UNESCO. World Book and Copyright Day. Available at: https://en.unesco.org/commemorations/worldbookday. Accessed April 5, 2019. Watters, Ron. The Reviewer’s Ten Most Influential Environmental Books of the 20th Century. Available at: http://www.ronwatters.com/BkTheRev.htm. Accessed April 5, 2019.